More often than not, a physician’s first course of action for knee pain relief has been writing a prescription for pain pills. However, the country’s current opioid crisis has focused on other types of medical pain relief options, including joint injections and physical therapy. Let’s take a closer look at how these two treatments are used for knee pain relief. Joint injections are becoming more widely prescribed for medical pain relief. Advantage Healthcare of Charleston has found great success in using hyaluronate injections for knee pain relief. Hyaluronate is a gel-like substance designed to act as a lubricant and shock absorber within the knee joint. Hyaluronic acid is a naturally occurring substance that provides lubrication and cushioning of the joints and bones. Osteoarthritis causes the knee’s own cartilage to thin over time, thus providing less lubrication and protection. Hyaluronic acid has proven very successful in knee pain relief. The hyaluronate is administered in three to five injections given once a week in the affected knee. Most patients report that joint injections offer knee pain relief for up to six months. Physical therapy is often prescribed in conjunction with joint injections and other medical pain relief treatments. Strengthening the calf muscles, improving flexibility and increasing overall strength are all important factors in helping promote knee pain relief. 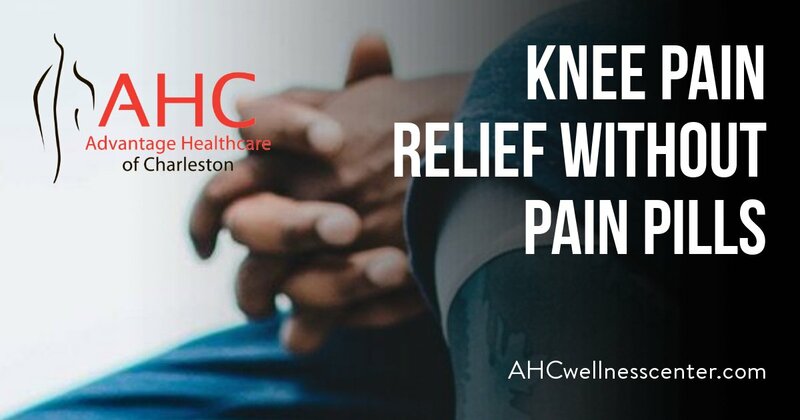 Advantage Healthcare of Charleston has a team of qualified physical therapy professionals to help you with exercises and techniques designed to strengthen the knee joint and surrounding areas. If you are in need of medical pain relief and desire options other than pain pills, our physicians and physical therapy professionals can help. We will assess your pain and develop a personalized treatment plan designed to help you achieve a pain-free life! The goal of physical therapy is to re-train the body to function properly. When the body is functioning properly, injury occurrences are significantly decreased. Physical therapy can help relax soft tissues and tight muscles that are related to knee pain. Physical therapy is also used to strengthen and stabilize the muscles, tendons and ligaments around the knee joint. Passive physical therapy may be recommended for individuals with severe knee pain. This can involve transcutaneous electrical nerve stimulation (TENS), ultrasound, heat, ice and stretching. Hydrotherapy is a type of physical therapy that uses water to take the weight off of joints and allow the muscles to relax. Knee exercise and knee extensions performed during hydrotherapy can help a patient regain and/or improve muscle strength. Hydrotherapy is also used to increase blood circulation, which is especially helpful for people suffering from arthritis related knee pain. Joint injections can help relieve knee pain in a matter of hours. Joint injections reduce inflammation and are used in physical medicine as an alternative to pain medication. There are many types of injections that may be used including: hyaluronate to improve the cushioning in the joint, platelet rich plasma injections to assist with healing, as well as more traditional medications. At Advantage Healthcare of Charleston, all joint injections are administered under fluoroscopic guidance. A fluoroscope is a real time x-ray that allows our providers to see the joint at rest or in motion. This technology also enables our provider to efficiently deliver medication to the appropriate joint space. These are just some of the treatments we may recommend to you for knee pain relief. Next month, we will take a closer look at additional treatment options for knee pain relief including myofascial release therapy, platelet rich plasma (PRP) injections, durable medical equipment and medical weight loss. – comes on suddenly and is usually associated with an injury such as a ligament or meniscus tear or broken bone. – examples include infections, excessive weight, lack of muscle flexibility and/or strength, previous injuries, etc. –includes issues with the bursa, tendonitis, osteoarthritis, patellar syndrome, etc. Associated symptoms that come along with knee pain vary and can include limited range of motion, popping or crunching, weakness, swelling, warm to the touch, stiffness and instability. Narcotic pain killers and surgery are generally the recommended courses of action in traditional medical practices. However, AHC takes a different approach, offering less invasive and safer physical medicine services for knee pain. In fact, as physical medicine practitioners, we specialize in surgery-free knee pain relief. Are you in need of knee pain relief? If so, give us a call and book a consultation. We will diagnose the cause of your knee pain and develop a customized, surgery-free treatment plan to help you get back to doing the daily activities you enjoy…pain free!